Chair Entertainment reveals the first events for its highly anticipated update. 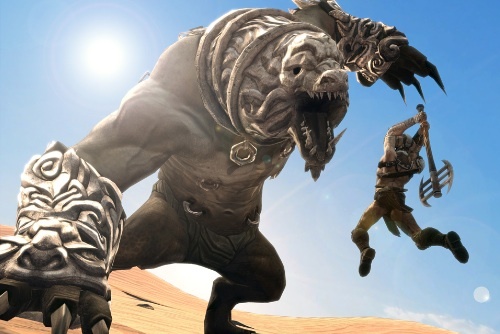 This Thursday, Infinity Blade 2 will become a lot more interesting with the addition of ClashMob, a new mode that lets fans around the world team up to complete various challenges and earn exclusive loot. The update will be available at midnight, April 12, and events kick off at 1:00PM ET. In fact, Chair Entertainment announced the first three events, as well as the rewards. A Lupun has stolen the village tribute! Deal as much damage as you can. Do your part to defeat the Titan! A horde of Iron Lancers have surrounded the Village Well! Kill once in time, do your part to defeat them all! Collect as many gold bags as you can!